This has been a month in the works - I'm a little behind. 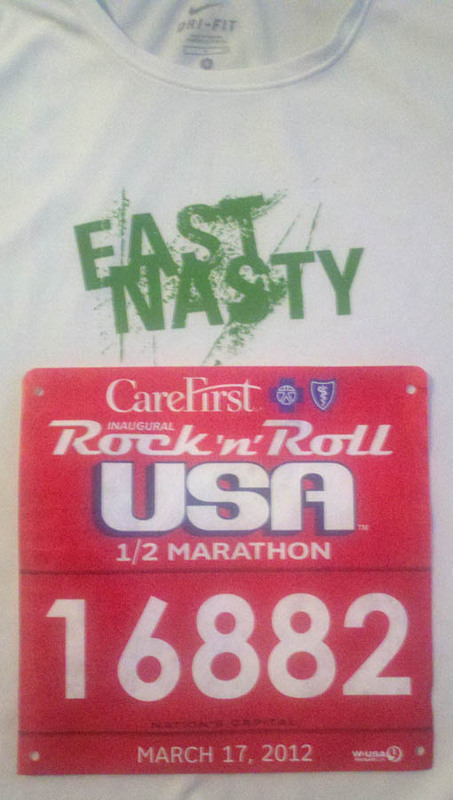 Here, finally, is my recap the Rock & Roll USA Half-Marathon, which was March 17th. We (Dudley, my parents and me) started our morning at 6am and headed down to the Metro, which was the suggested transportation from the Race Directors. They made it very clear that parking was limited and racers would need to Metro down. Being that I'm from the DC area, taking the Metro was a no-brainer. There was a stop right at the Start / Finish line. SO much easier than driving downtown....unless the train breaks down. Which it did. Apparently, so many people got on the Metro at the stops leading into the race area, that the doors of the train broke. So here we were sitting on a VERY crowded Metro train, just waiting for things to get fixed. We were on the train for about 20 minutes before an announcement came over stating that we have to evacuate the train. It is now 7:30. The race starts at 8:00. No announcement about if another train is coming, or when this one is going to get rolling again. Just "Get off the train." So we do. Immediately, about 1/3 of the runners start running towards the escalators leading out of the Metro station. I know from the signs that we're at the Smithsonian station, but unfortunately, I have no idea where that is in relation to where the race start. All I know it that's somewhere behind the Capitol. (And when I lived here, "somewhere behind the Capitol" is NOT a place where you'd want to get lost.) After a short discussion with my parents, Dudley and I decided to make a run for it. That we would just follow the other runners the 2.5 miles to the start. So we exit the station and it looks like a scene from an Armageddon movie. Runners are everywhere trying to figure out where to go. They're pounding on cabs, trying to get their attention. They're running across busy street to get to the DC Rental Bikes. It's nuts. Again, it's now about 7:35. 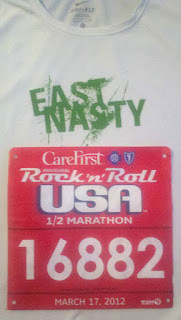 I figure we'll be able to cover the 2.5 miles in time for the race to start as long as we hustle. It'll just be a good warm-up, right? Wrong. I'm not sure who the person was that told me it's 2.5 miles to the race start, but they had no idea what they were talking about. We walked for about 20 minutes and had just passed the Capitol when we saw someone ahead of us finally hail a cab. We started yelling and were able to get them to wait for us. We still had about another 2.5 miles to go! We never would have made it if we had tried to walk the entire way. We pulled up to the start at about 8:10. The race had already started, but we were in Corral 16 so we had a little time to spare. We waited in line forever for the Port-a-John (all the while a volunteer was yelling at us to get in our corrals) and then moved to the race start, where we jumped in with Corral 20. What made me mad here is that there was a REALLY long line for the Port-a-Johns right at when you got to the race, but there were about 30 that were not being used at all just out of sight, around the corner. REALLY? Why not move those so people knew to use them? Anyway, we finally get started. It was a BEAUTIFUL day in Washington, D.C. with a clear, bright blue sky. Unfortunately, it got a little hot on the route, but not too bad. All was well until about mile 4 when I needed to use the Port-a-John again. Nerves from the crazy morning, I guess. I saw one behind a band stage, but there were about 15 people already in line. I knew there were two about a mile up the road, so decided continue on to there. BIG MISTAKE. We waited in line for TWENTY MINUTES. It's one of those situations where you're damned if you wait and damned if you don't. We thought about moving forward to the next set, but we didn't know how far up the road they were. (They weren't marked on the map or at every mile like most big races.) It turns out the next set wasn't until around mile 8, so it was good we stopped, but it just KILLED our time. All together, I counted SIX Port-a-Johns on the course. No where near enough for the 25,000 runners there. Other than that, the race itself was pretty standard. I felt OK. I was pretty much ready for the race to be done at mile 10. Dudley did great. I guess my Couch-to-Half Marathon training program worked OK for him!! Overall, I think it was a good race, on a beautiful day in one of my favorite cities. It just would have been nice to know what our race would have been like without the Metro madness and the twenty minute delay in the middle of the race!